While you’re enjoying the excitement of the Melbourne Essential Baby and Toddler Show this weekend, take a moment to think about what’s really in your child’s best interest. State Trustees might seem like an odd stand to visit at this weekend’s Essential Baby and Toddler Show at the Royal Exhibition Building in Carlton, but a quick visit might be the best thing you can do for your child. The best way to protect your child’s future is to appoint a guardian and have your wishes clearly stated in a legal Will. It can be daunting as a parent to think about what would happen if you weren’t around, especially in the lead-up to having your first child. In the excitement of a new addition to your family, it can be easy to put off a simple step that may have a profound impact on your child’s life. State Trustees research shows that a staggering 55 per cent of Australian parents with children under the age of 18 do not have a Will. Of those that do have a Will, nearly half have not nominated a guardian for their children. Many people assume the other parent or their family can automatically step in if something happens, but this is not necessarily the case and the best protection for your new bundle of joy, and for any child under the age of 18, is to name a guardian in your Will. State Trustees has developed a low-cost Will Kit which will be available to purchase at this year’s Essential Baby and Toddler Show to encourage new parents to prepare a Will and name a guardian. 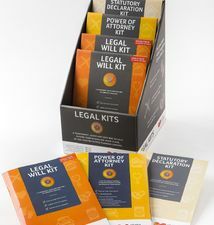 For more information about Wills or guardianship, visit the State Trustees (Stand E32) at The Essential Baby and Toddler Show from 10-12 April or take a look at our FAQs for new parents at www.iwillkit.com.au/newparent.